The upper market house, designed by architect Thomas Pope as an open market, was built in 1853, the oldest cast iron market house in the country. The lower market house, designed by Wheeling architect Edward B. Franzheim, was added in 1890. The two structures still function as market houses, and the entire neighborhood, enjoying a renaissance as a hub of activity and development in the City, is brimming with food, artwork, antiques, and more. 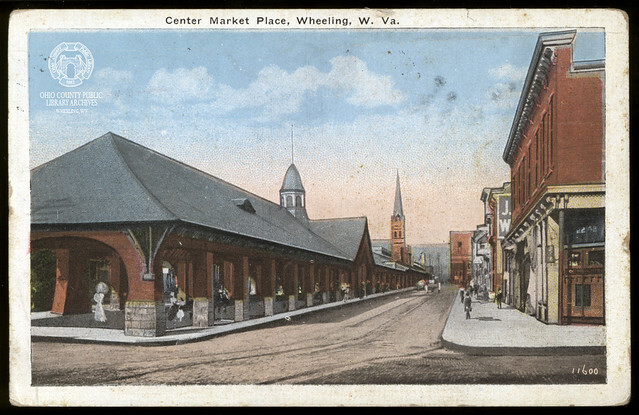 Centre Market was listed on the National Register of Historic Places in 1975 and is part of the greater Centre Market Square Historic District. From the HABS/HAER Survey (1974): "The 1853 structure was originally designed as an open market in the neo-classical style, with three aisles and cast iron Doric columns. The columns were cast by the Hamilton and Rogers Foundry, in Wheeling, and alternate columns serve as downspouts. The building has a gabled roof with a denticulated cornice, and a belfry at the south end. The stalls, which could be rented from the city, were arranged in three rows: vegetables were sold on either side and butchers occupied the center area. In the twentieth century, the stalls were replaced by refrigerators, display cases, and folding tables, and the market structures w[ere] enclosed with cinder block infill construction. The cinder block walls were built around the columns so that they area still visible on the outside of the building."